Kinnas, sõrmkinnas (gloves), ERM 4565, Eesti Rahva Muuseum. When I visited Estonia several years ago, I fell head over heels in love with the embroidered textiles I saw in museums and private collections. Estonian embroidery can be found on woven fabrics like linen shirt collars and cuffs, fulled woolen coverlets, and aprons. Other examples adorn knitted pieces, such as mittens, gloves, and the button bands on fitted jackets. It’s fascinating to look carefully at these pieces and see how different types of yarns were used to knit or weave the base and stitch the embroidery. Often the embroidery alone will incorporate several different yarns. Creativity and thrifty use of materials combined to express cultural identity in endlessly captivating ways. 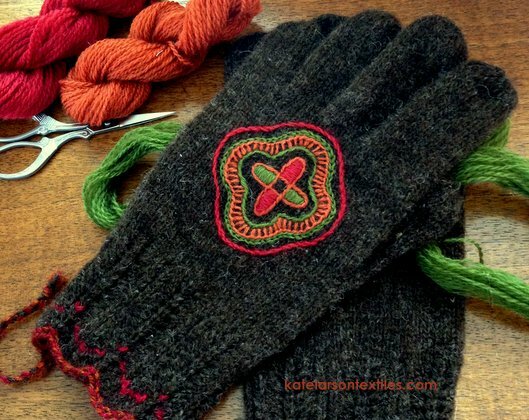 Kate Larson’s handspun, Estonian-inspired gloves. The Trading Post for Fiberarts in Pendleton, Indiana March 27, 28, 29, 2015. Join Kate Larson and Nancy Bush for a weekend visit to the world of Estonian spinning and knitting. Our days will be focused on creating Gloves, Mittens or Mitts (your choice) which include interesting Estonian cuffs and can be embellished with traditional embroidery motifs from southern Estonia and one of the most traditional islands, Kihnu. Learn how to spin a wool yarn close to what the Estonians use for their base yarn, and then how to spin several wool embroidery yarns for the embellishments. We will use a variety of different wool fibers from Estonia and closer to home. The course will also cover several Estonian cast ons, some traditional cuff patterns which include colorful lateral braids, and other uniquely Estonian techniques, thumb and finger construction for gloves, as well as mitten and mitt construction, and how to decorate and finish each item. Included in the class will be enough commercial yarn to complete each pattern offered. $345+materials fee. For more details visit the Trading Post. To register, contact Susan Markle at tradingpostfiber@aol.com. Skill level: Comfortable knitting in the round on double pointed needles or circulars and beginning spinning skills. No embroidery experience necessary. If you would like to take class with Kate before the workshop to expand or brush-up your skills, join us at the Trading Post on Saturdays. See the schedule here. How exciting Kate. Your gloves are beautiful. Someday…..I will be able to attend one of these nice woolly events!